In 1900, Kodak introduced the first Brownie camera, which brought the hobby of photography within financial reach of consumers. The camera sold for $1 and film was 15 cents a roll. Also in 1900, J.W. Schmitt joined the practice that would become Farrish Johnson Law Office. 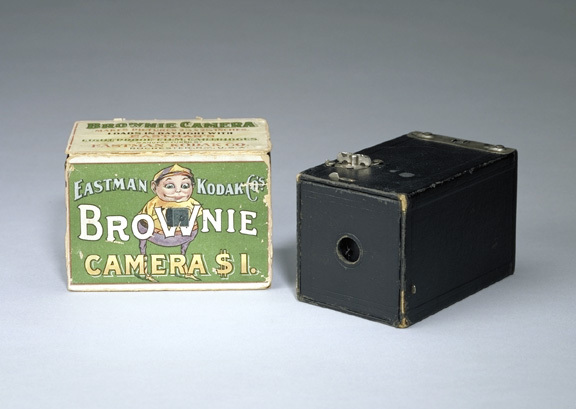 Introduced in February of 1900 by Eastman Kodak, the Brownie camera provided low-cost photography to the people. It was produced so inexpensively that anyone, not just professional or wealthy individuals, could own one. For less than $2, anyone could buy the Brownie, a roll of film, and get it processed. It was also very simple to use. The camera was a leatherette covered card box with a wooden film carrier. The original had no finder but had V sighting lines on top and a detachable film winding key. A clip-on accessory reflecting finder was later available. This camera introduced the 2 ¼” square format. The name comes from Canadian illustrator and author Palmer Cox’s comic, The Brownies, published in magazines and books in the late 19th and early 20th centuries. Over 150,000 Brownie cameras were shipped in the first year of production. They were extensively marketed to children and were also taken to war by soldiers. John W. Schmitt was born August 12, 1875, in Paynesville, Minnesota. Mr. Schmitt’s father, John Henry Schmitt, was a German Evangelical minister who served much of southern Minnesota and northern Iowa before settling in Waseca, Minnesota. Upon John Henry Schmitt’s death in 1889, his widow, Maria, and their seven children moved to Mankato. To sustain her family, Mrs. Schmitt ran a boarding house. She was committed to the education of her sons and it is believed the sons waited in turn for their college educations; after graduation each brother was responsible to see the next brother received a college education. The four sons were duly educated, becoming either attorneys or physicians in their turn. J.W. Schmitt graduated from Mankato High School in 1896 and taught school in Mankato before pursuing his legal studies. 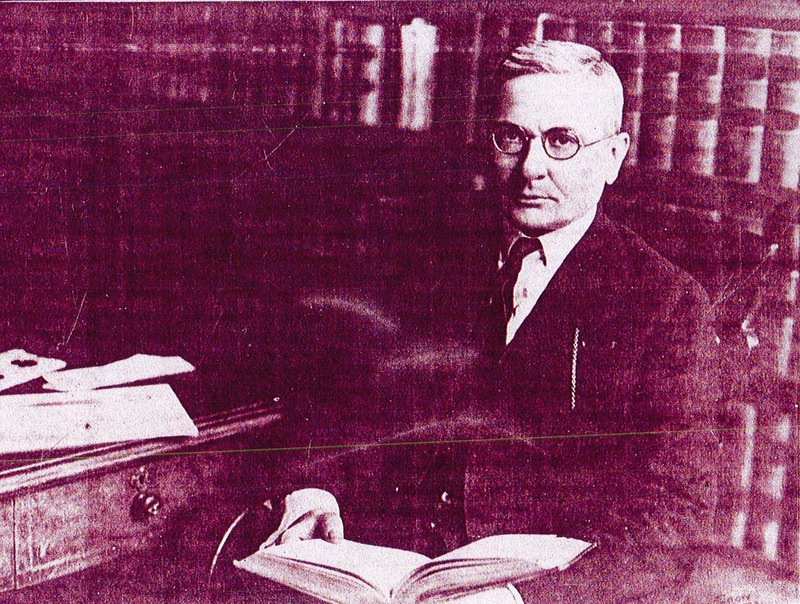 After graduating from the University of Minnesota Law School in 1900, Mr. Schmitt returned to Mankato and joined his brother, Harrison L. Schmitt, in the practice of law. Also in 1900, an eight-inch Howitzer, a captured Spanish gun from the Spanish-American War, was secured for the G. A. E. of Mankato, through Congressman James Thompson McCleary and placed in Lincoln Park in May. 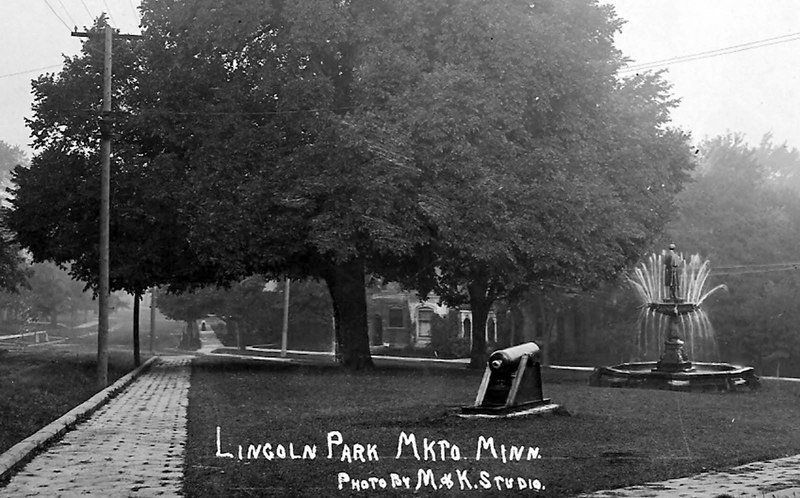 Lincoln Park, located at 200 Lincoln Street, was a gift to Mankato from John H. Ray in the 1890s. 1900 was an important year for the local railroads. The Chicago and Northwestern Railway determined to build up the Minnesota valley and straighten its approximate 14-mile line between Mankato and New Ulm. The Mankato and New Ulm Railway Co. was formed on January 16, 1899. Surveys were at once made, right-of-way purchased, and the grading began in May 1899. The road was completed by May 29, 1900, when the first train was run over it. The building of this new railway added two new townsites to Blue Earth County, Judson and Cambria, both of which were laid out early in the spring of 1900, by the railway company. A depot, elevator, store, blacksmith shop, creamery and church were built at Judson; and at Cambria, a depot, elevator, store, blacksmith shop, creamery, Woodmen’s Hall, and two or three residences were erected. Mr. Schmitt was united in marriage to Laura Elizabeth Beatty on June 26, 1905. They had one son and three daughters. In 1907, Mr. Schmitt was appointed city attorney and served in that capacity until 1911. He was elected Blue Earth County attorney for two terms from 1911 to 1918. The brothers practiced together until approximately 1919 when Harrison Schmitt moved to Minneapolis. That same year Mr. Schmitt befriended novelist Sinclair Lewis, the Nobel prize winning author. Lewis lived at the J.W. Schmitt home for several months, during which time he completed Main Street and Free Air. Learn more about Mr. Lewis and his time in and around Mankato here. Mr. Schmitt continued to practice law with attorney H.W. Volk. When Volk left the practice in 1926, Mr. Schmitt hired recent law school graduate Charlotte Farrish, with the agreement she would work the first year without pay. Farrish described Mr. Schmitt as “very brilliant, but rather severe.” She also considered him to have one of the finest legal minds she ever knew. Learn more about Ms. Farrish here. Mr. Schmitt was a conservation leader and was recognized by the United States Biological Survey for his conservation work in creating game havens on the nearby lakes. He was a member of the Mankato Izaak Welton Leagues, the Southern Minnesota Improvement Association, and the Lake Washington Club. He was also a member of several organizations, including the local Masonic Lodge, the Mankato Elks Club, the Kiwanis Club and the Mankato Chamber of Commerce. 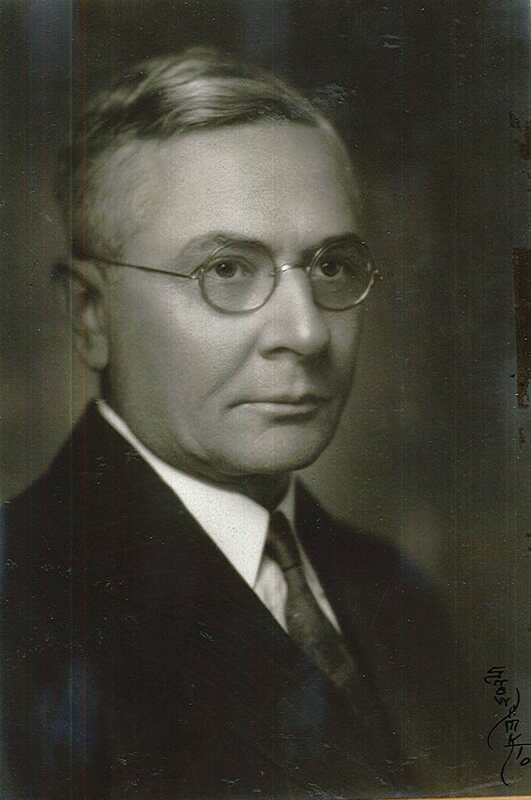 He served as member and president of the Board of Education. Mr. Schmitt died March 17, 1936. District Judge Harry A. Johnson stated the entire community suffered a great loss with the death of Mr. Schmitt. He indicated Mr. Schmitt had been an outstanding figure in the legal field as well as giving of his time to conservation measures and to education. County attorney G.A. Johnson stated, “The more you saw of J.W. Schmitt, the more you liked and respected him for his inherent honesty, his frankness and kindness.” Several legal professionals and community members fondly remembered Mr. Schmitt, describing him as a dedicated community leader and brilliant lawyer. January 3, 1900: The United States Census estimates the country’s population was 70 million. 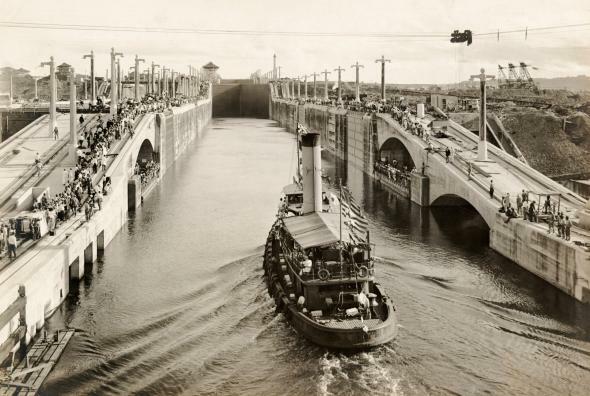 February 5, 1900: The United States and the United Kingdom sign the first Hay-Pauncefote Treaty for the Panama Canal. A seagoing tug makes the first trial run through the Gatun Locks on September 26, 1913. March 14, 1900: US currency goes on the gold standard after Congress passes the Currency Act. April 12, 1900: The US Congress passes the Foraker Act, establishing Puerto Rico as an unincorporated territory, effective May 1. 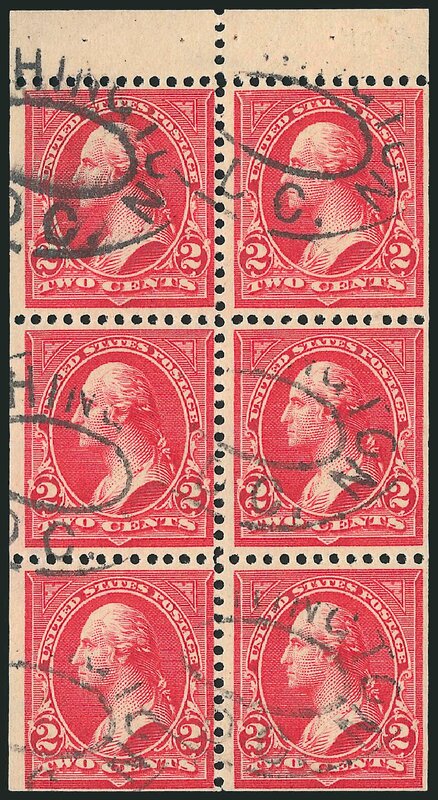 April 16, 1900: US Post Office issues the first booklets of postage stamps, containing 12, 24, or 48 two-cent stamps. Paraffined paper was placed between sheets of stamps to keep them from sticking together. April 30, 1900: Hawaii becomes an official U.S. territory. May 14, 1900: Blue Earth County inaugurates its first rural mail route. It started from Amboy and embraced thirty-six square miles of territory, serving a population of 660 persons. A. B. Burgess was appointed its first carrier. In September, a second Rural Route was established at Vernon Center, and the third from Mankato in October. 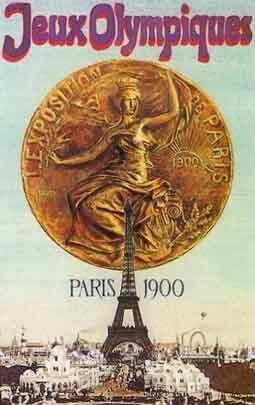 May 20, 1900: The second modern Olympic Games opens in Paris, lasting for 5 months. It is the first Olympics where women were allowed to compete. On July 11, Charlotte Cooper beats Hélène Prévost to become the 1st female Olympic tennis champion and the 1st individual female Olympic champion in any sport. The event closed on October 28. June 6, 1900: US Congress passes an act authorizing a civil code and government for the territory of Alaska after gold discoveries bring lawlessness and disorder to the area. 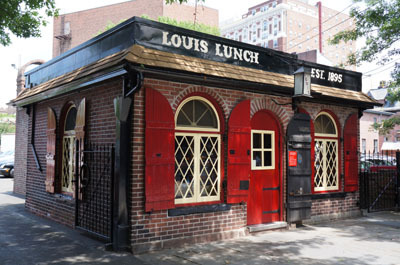 July 28, 1900: Louis’ Lunch restaurant in New Haven, Connecticut, sells the first hamburger in the US. The hamburger was created by Louis Lassing in response to a customer’s hurried request for a lunch to go. While recognized in the Library of Congress as the origin of the hamburger, other claimants and detractors exist. November 6, 1900: Republican US President William McKinley and his Vice President, Theodore Roosevelt, defeat Democrat William Jennings Bryan in the US Presidential election. 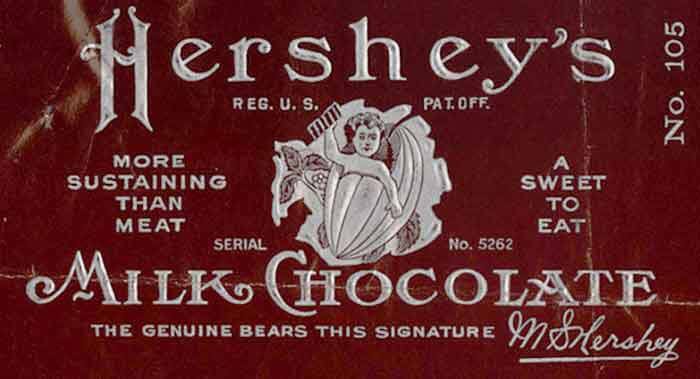 1900: Milton S. Hershey introduces the milk chocolate Hershey bar.